In 2016, OvaCure launched the first Collaboration Labs, dedicated to accelerate existing pipeline projects. The labs offer international clinicians and researchers opportunity to further define the clinical design needed to initiate their projects. OvaCure Scientific and Clinical Advisory Board is committed to optimising the projects while OvaCure and Anticancer Fund are responsible for project managing. This ensures optimal and efficient use of funding. Results are reported and evaluated upon achieved milestone timelines. Projects supported by OvaCure are carried out at research centres where operations, personnel and facilities are already established with medical infrastructure as well as quality compliance systems. 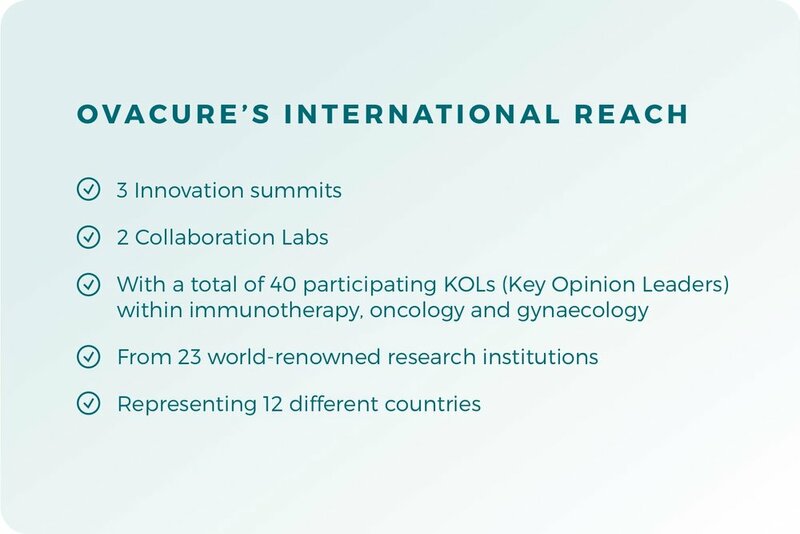 The annual OvaCure Innovation Summits bring together leading international experts within ovarian cancer, immunotherapy, oncology and innovative technologies. At the summit, experts provide inspiration and collaborate to develop clinical projects with the greatest potential to cure. OvaCure's Scientific and Clinical Advisory Board then co-create, innovate and invest in new research projects focusing on treatments with breakthrough potential to cure ovarian cancer. Specific criteria for selecting the participants ensures the highest level of expertise is applied to each project. Nominated research projects must have the potential to be studied in clinical trials within a reasonable time frame, ensuring an efficient journey from the laboratory to the patient. Each year our Scientific and Clinical Advisory Board creates a new top line question which is examined during the summit. To participate in OvaCure Innovation Summit, please submit a 1 -page letter of interest addressing the top line question. Our board then selects participants who will be invited to the summit. 18 Key External Experts from 8 countries united forces to identify the most promising approach for successfully treating OC patients. Our pipeline project CAR T-cell Therapy was the great product of that effort. "Innovative Immunotherapy in Ovarian Cancer including combination and monotherapy"
"To identify and develop high quality projects within immunotherapy and ovarian cancer and assist the implementation of relevant scientific research"